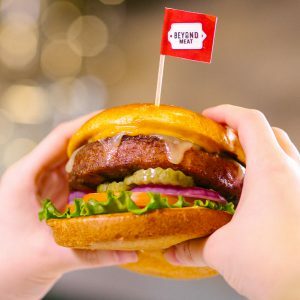 The Beyond Burger is Officially Joining TGI Fridays Menus NATIONWIDE! 2018 you're already looking pretty spectacularly plant-based! We are so excited to officially announce that TGI Fridays has beefed up all 469 of their locations' menus with The Beyond Burger. They initially tested The Beyond Burger at a handful of locations this past October, and after an extremely successful test, it's becoming the fastest test-to-table menu offering in the brand's history. Consumer adoption of plant-based products are quickening month over month (even being hailed as a top food trend of 2018! ), and we could not be more pleased that an iconic global restaurant brand, TGI Fridays, is adding The Beyond Burger to their menu! Starting today, The Beyond Burger will be featured on the TGI Fridays menu as The Beyond Meat Burger and features a 6-oz. patty seasoned, grilled and topped with white cheddar, lettuce, tomato, red onion, pickles and Fridays sauce to appeal to heartier appetites. The Beyond Burger patty can be substituted for any existing builds from the TGI Fridays Burger Bar menu, served on the Challah Bun or "Green Style" on crispy green lettuce leaves without cheese or Fridays sauce for a vegan-friendly option. Can you tell the difference? The Beyond Meat Burger, shown above with the Really Good Cheeseburger, looks and satisfies just like a traditional beef burger. "Appealing to a more food-forward consumer is a key priority for Fridays in 2018," said David Spirito, Executive Culinary Director, TGI Fridays. "In answering guests demand for nutritional menu items that fit their lifestyle needs, we saw an opportunity to introduce newly expanded options like plant-based protein. Beyond Meat is leading the way in creating a juicy and delicious product that gives guests the sensory experience of a traditional burger without sacrificing taste."